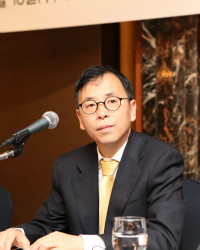 Dr Andy Xie 謝國忠, Shanghai-based independent economist, has just been named “ 50 Most Influential Persons in Finance”by Bloomberg, and is currently director of Rosetta Stone Advisors. Dr Xie is one of the few economists who has accurately predicted economic bubbles including the 1997 Asian Financial Crisis and the more recent subprime meltdown in the United States. He joined Morgan Stanley in 1997 and was Managing Director and Head of the firm’s Asia/Pacific economics team until 2006. Prior to that he spent two years with Macquarie Bank in Singapore, where he was an associate director in corporate finance. He also spent five years as an economist with the World Bank.